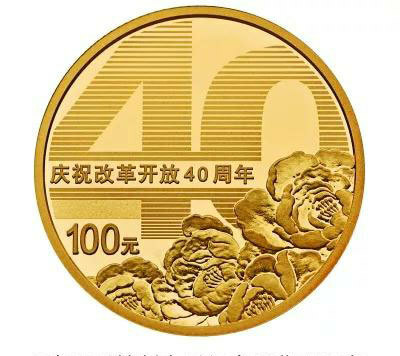 The gold and silver commemorative coins issued by the central bank to celebrate the 40th anniversary of reform and opening-up are now available, Chinanews.com reported on Wednesday. The People's Bank of China has issued a set of "reform and opening-up" coins including 1 gold coin, 5 silver coins and 1 double-color copper alloy coin. The gold coin containing 8 grams of pure gold is 22mm in diameter, with the denomination of 100 yuan. Its back pattern is a combination of the digital "40" shape and peony flowers, and the words "celebration of the 40th anniversary of reform and opening-up". The gold coins will be issued with the largest distribution of 20,000. 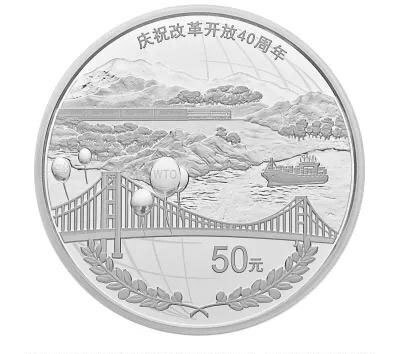 The back pattern of the 150-gram round silver coin is designed to symbolize the "Belt and Road Initiative" decoration of land, sea, bridge, olive branch, etc. Its maximum issuance is 4,000. The other four 30-gram silver coins are patterned with different symbols of memorabilia of the reform and opening-up. The gold coin will not be sold separately but will go with four 30-gram silver coins, at a price range from 9,300 yuan ($1,355) to 13,000 yuan ($1,896). Buyer can also only purchase the set of the four silver coins at a range from 2300 yuan to 2600 yuan. The 150-gram silver coin sells separately at more than 13,000 yuan. The gold and silver coins are distributed exclusively through the country's licensed or franchised gold coin retailers, and all of the coins will not be in circulation. To buy the first batch of the double-color copper alloy coins, people can make appointment from Dec 5 to 8 through the official websites of the four biggest State-owned commercial banks or directly to their business outlets. Its exchange limit is 20 for each buyer.